Holiday in a Box Shop co-founder Jennifer Bebon opens her pop-up shop in downtown Westport on Nov. 27. WESTPORT — In February, Michael Friedman’s wife found a box of photographs in the couple’s attic that contained a lost piece of rock ’n’ roll history. “Fifty years ago, when I was in the music business in the ‘60s, I was also a photographer. I wasn’t a professional photographer, but I was working with all these various artists in management,” said Friedman, a Weston resident. During the ’60s and early ’70s, Friedman photographed Janis Joplin, The Band, The Rolling Stones, Todd Rundgren, Kris Kirstofferson, and others. And then he proceeded to lose the photograph negatives. “I lost the negatives before I had a chance to even see them — because I hadn’t printed most of them yet — so it’s been a real walk down memory lane, and really fun,” Friedman said of re-discovering his photos over the past few months. Local developer David Waldman, a family friend of Friedman’s, caught wind of the re-discovered photographs and invited Friedman to showcase them in an still un-rented commercial space in Waldman’s downtown Bedford Square development. The “Friedman Gallery Pop-up” has occupied Church Lane for the past two months and plans to remain until Waldman rents the space out to a permanent tenant or until Friedman leaves to showcase his photographs at the California Heritage Museum in Santa Monica in the spring. So far, Friedman said sales at his gallery have been good, in part, because he feels the energy of the musicians he photographed resonates with the current political and artistic climate. “When (Richard) Nixon was president it was very much the same kind of polarization of them and us as there is today with (President Donald) Trump. It’s so extreme, and I think maybe it will give birth to some good music,” said Friedman, who grew up in Westport. Although Friedman’s photographs are one-of-a-kind, his gallery is not the only pop-up taking up shop in Westport this holiday season. Joy Schwartz runs the Westport pop-up shop, The Cashmere Sale, on Main Street. The Cashmere Sale started from an idea derived by three people sitting at a kitchen table 17 years ago in Greenwich and has grown to manufacture cashmere products and operate 25 pop-up shops nationwide during the holiday season. “You have to buy it when you see it. That’s the whole philosophy of it. We don’t restock, we’re not a store, so the sense of urgency is very legitimate in the beginning,” Schwartz said of the heavy crowds that hit the Cashmere pop-up when it opened in October. Building on the sense of urgency, Schwartz said the shop will close Dec.10. The Holiday in a Box shop has also found success as a pop-up this year. Located at Post Road East, the shop began as an e-commerce site that curates and delivers holiday decor in a manner similar to other curated product-delivery services, such as Blue Apron, a pre-planned meal service. “Pop-up shops are all the rage. This really is the year of the pop-up shop,” said Jennifer Bebon, a Holiday in a Box shop co-founder. Bebon, a Fairfield resident, said the retail presence has enhanced the company’s online efforts. In addition to the Holiday in a Box shop’s seasonal decorations and hostess gift products, the pop-up also sells specialty foods from Gourmet Cravings, a newly-launched imported food service started by Bebon’s friend, Susanne Witte Settineri, a fellow Fairfield resident. 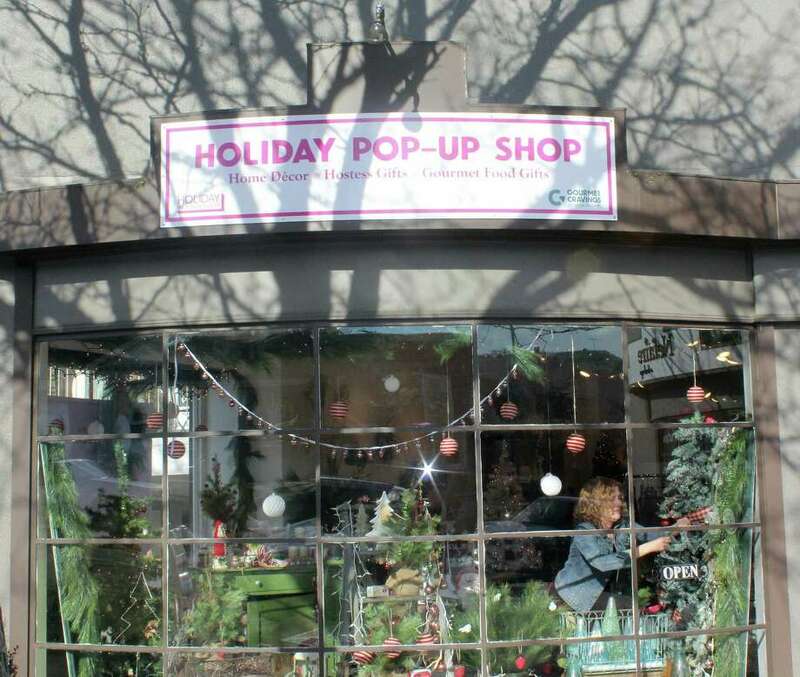 The Holiday in a Box pop-up is located in the former location of 2nd Time Around, a vintage clothing store that closed in May. Second Selectman Jennifer Tooker, who announced during the election season that she would focus on increasing the town’s economic vitality if elected, agrees pop-ups are an intriguing idea for Westport’s retail woes. For now, the pop-up experiment will continue, which Bebon, who, in addition to the holiday shop, has had a successful career in public relations for retail companies, said is true to form for Westport. The town, she said, has long been at the forefront of testing out new retail strategies. “There’s an old saying on Madison Avenue in New York City: Put it on the 5:15 (train) and see if it gets off in Westport. What that means is the advertising industry tested their new concepts in Fairfield County and in the Westport area. If it worked here, they knew it would work everywhere,” Bebon said.